Today Duke and Duchess of Cambridge started 2nd day of the Poland tour. The first stop of the day is Stutthoff Concentration Camp in Gdansk. Stutthof was the first Nazi Germany Concentration Camp set up outside German borders, about 20 miles from Gdansk, in September 1939 and one of the last camps liberated by the Allies in May 1945. Around 110,000 people, men, women and children, from 28 countries were imprisoned in Stutthof, where as many as 65,000, including 28,000 members of the Jewish community died. Stutthof is now run as a museum. Today the Duke and Duchess met the senior staff from the institution before being taken to a barracks and shown discarded shoes from Holocaust victims. 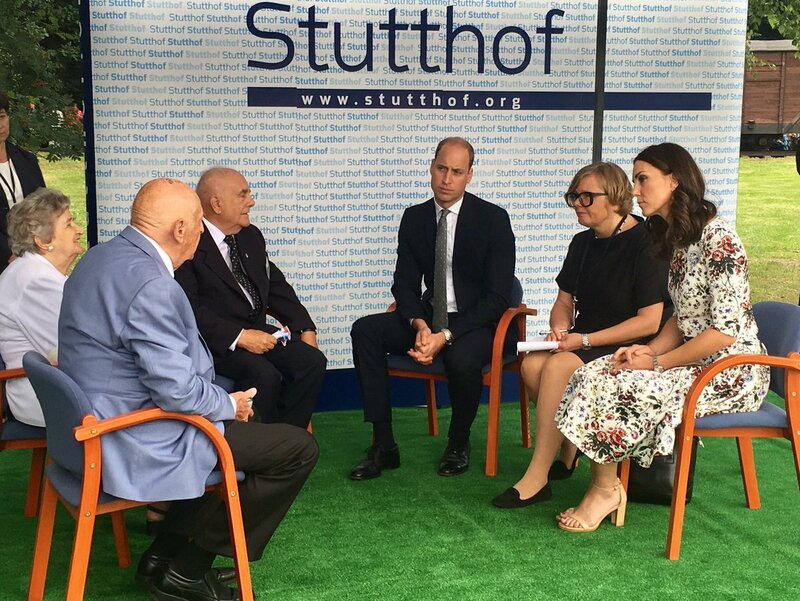 The Duke and Duchess were shown a series of exhibits that illustrate the conditions in which prisoners had to live at Stutthof. Mr Goldberg, 87, called the day a “seismic event”, admitting he had hesitated return to Stutthof but had decided to “finally face the past” with the Royal couple by his side. Mr Shipper, who survived Auschwitz-Birkenau before being sent to Stutthof, said the visit “means so much” as he paid tribute to the friends, including Mr Goldberg, who saved his life by supporting him on the final death march when they were both just 15. Duke and Duchess of Cambridge with Mr. Zigi and Mr. Goldberg at the ‘Death Gate’ of the former Nazi camp. During the emotional visit to the Nazi Camp Duke and Duchess signed the visitors book at Stutthof concentration camp. After that Royal couple headed towards the Gdansk Town to experience the traditional Polish market. At Polish market the royal couple received a warm and grand welcome from Polish people. Duke and Duchess of Cambridge then joined the Gdańsk Mayor Pawel Adamowicz for the street party in the town market. Couple enjoyed the local delicacies – Goldwasser a traditional liqueur with flakes of gold and some delicious pierogi in the market. They were shown a demonstration of amber processing. Gdansk is famous for its amber as The Duke and Duchess were able to see for themselves. The next stop of the day was Gdansk Shakespeare theatre. Prince of Wales is the patron of the theatre, where the royal couple watched a performance. The final stop of today’s agenda was William and Kate visiting the European Solidarity Centre, in Gdansk’s shipyards the birth-place of the Solidarity movement in Poland. The Duke and Duchess toured the museum there and met the founding members of Solidarity. At the centre The Duke and Duchess placed cards on a solidarity wall that is covered in personal messages from the public. On departure they walked through the iconic shipyard gates, a key symbol of the protests during the 1980s, before laying flowers at the foot of the Solidarity Monument to Fallen Shipyard Workers, who died during the suppression of a workers’ strike in 1970. Today, Kate stepped out wearing a sombre white two piece floral ensemble from Spring Summer 2017 collection of Erdem. The two piece ensemble includes a printed custom made top with imari skirt from Erdem. 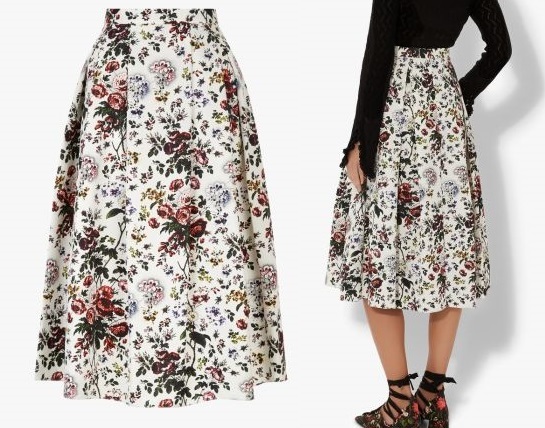 The skirt is the classic midi length in Hurst Rose print made of cotton faille with a slight sheen. The versatile fabric helps hold the silhouette of the skirt. It has feminine volume created by tucked folds, a fitted high waist, pockets and concealed zip at the centre back. The top wore by Kate is not available as it was a custom piece made to be paired with the skirt. The waist length top features what seems to be a boat/square neck, elbow length sleeves with side zipper. Duchess paired her outfit with new Stuart Weitzman NearlyNude Ankle Strap Sandals. Made from glossy beige patent-leather, this pair features two slim straps and a manageable block heel. The sandals are available at Net-A-Porter for $400 in the same tone as well as in black. They are also currently availble on official online store of Stuart Weitzman and NordStrom. 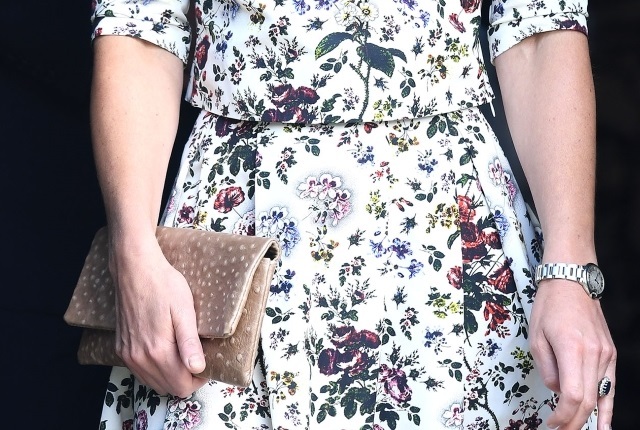 Duchess was carrying a matching clutch from Polish brand Etui Bags with her favourite Cartier Ballon Bleu watch that is available at Saks Fifth Avenue. Today Duchess was seen wearing a new gold earrings and necklace. The set is made of Amber stone in gold known as Milk Amber. It is believed that it could be a gift from Polish First Lady to Duchess. Another Look at Duchess’ outfit of the day from different angles. This royal tour held another memorable moment. Cute little Princess Charlotte was seen wearing her Uncle Prince Harry’s shoes, that he wore during the Wales tour to Poland in 1986. Tomorrow the royal couple will head towards Germany for the second leg of the tour where they will be staying at the Ambassadors’ residence.